With more than 30 years on Capitol Hill, author Elise J. Bean has a rare insider’s view of how the world of Congressional oversight operates. Ms. Bean — who spent 15 years working for Senator Carl Levin (D-MI) at the U.S. Senate Permanent Subcommittee on Investigations — knows how Congressional oversight investigations can be powerful ways to uncover facts, build bipartisan consensus, and foster change. Ms. Bean will talk about her experiences and the insight it provides on Sunday, September 30 at 3:00 pm at The Mark Twain Library. 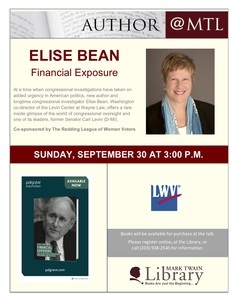 In her book, Financial Exposure: Carl Levin’s Senate Investigations into Finance and Tax Abuse, Ms. Bean describes Levin-led investigations from 1999 to 2014 into money laundering, offshore tax abuse, and banks behaving badly. She explains how they achieved policy reforms, despite rampant partisanship and dysfunction. She concludes by encouraging the public to demand fact-based, bipartisan, high-quality oversight from the next Congress. A graduate of Wesleyan University, Ms. Bean is currently the Washington Co-Director of the Levin Center at Wayne Law. This program is co-hosted by the Redding League of Women Voters. Please register online, at the Library or call 203-938-2545 for information. The Mark Twain Library is owned by the Mark Twain Library Association. It was founded in 1908 by Samuel Clemens – Mark Twain himself – one of Redding’s most celebrated residents. Visit www.marktwainlibrary.org, for more information.